Variety theatre, opened 1920. Damaged in World War II. In 1960, provisional home to the "Wühlmäuse" cabaret company. Later demolished. 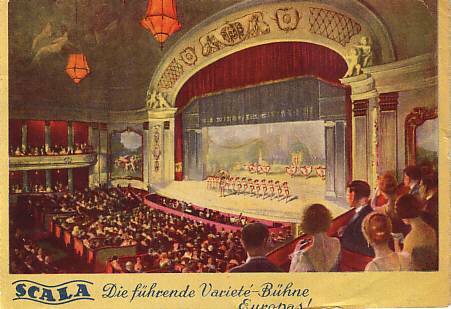 Front Text: "Scala - Die führende Varieté-Bühne Europas!" Reverse Text: "Scala - Berlin W 62, Lutherstr. 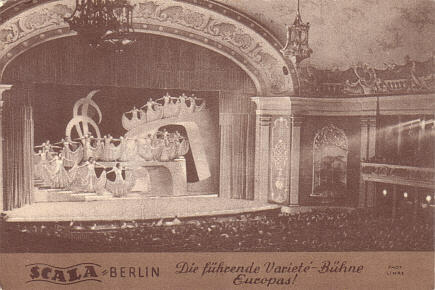 22-24"
Front Text: "Scala - Berlin - Die führende Varieté-Bühne Europas!" Reverse Text: "Scala - Berlin - Die führende Varieté-Bühne Europas!"